The EHF Court of Arbitration gave an official update on the status of the case. On Friday, 15 January 2010, the European Handball Federation received an official letter from the ECA (EHF Court of Arbitration) regarding the case of former coach of Hypo Niederösterrecih, Mr. Gunnar Prokop. 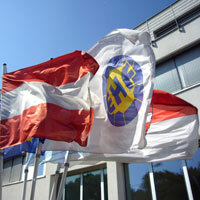 As it was published earlier, the EHF Arbitration Tribunal punished Mr. Prokop and the Austrian club Hypo Niederösterreich for serious unsportsmanlike conduct committed at a Women’s EHF Champions League game on 29 October 2009.The EHF Arbitration Tribunal gave a fine of €45,000 for the coach of Hypo Noe, Gunnar Prokop, who was also excluded from all international handball competitions and from any EHF activities for a period of three years. Furthermore, he was banned from taking any EHF function for life The club Hypo Niederösterreich was fined €30,000 and the point gained by the club at the game in question was deducted. The decision was appealed by the parties involved who filed a claim at the ECA. The letter by the EHF Court of Arbitration (see verbatim copy below) gives an update on the status of the case. Please be informed that the final award of the captioned case will be rendered and communicated on January 18, 2010. On January 14, 2010, the ECA arbitral chamber offered the parties to issue a partial award (including the final decision) on January 15, 2010, to be followed at a second stage by the complete factual and legal reasoning on January 22, 2010. This suggested mode of rendering the award in two stages was made for the benefit of the sport, and proving the clubs due information regarding the conditions prior to the matches to be played on January 15, 2010. However, this was not expressly accepted by both parties. In consequence thereof the ECA arbitral chamber decided to render the complete award of the ECA case n° 20031 on January 18, 2010. As this information may be of importance for the EHF competitions in which the parties are involved, the ECA arbitral chamber hereby agrees to the publication of the content of the present letter via press statements by the parties.